It’s a very subjective topic that poses questions like…. Is the team stacked with talent and anyone could coach that team and win? Are injuries a factor throughout the season? Do we purely measure a coach on overall wins and championships? What data is really out there that we can say a coach was fully responsible for vs a player? So many questions and really a lot of it comes down to opinions rather than data based evidence. 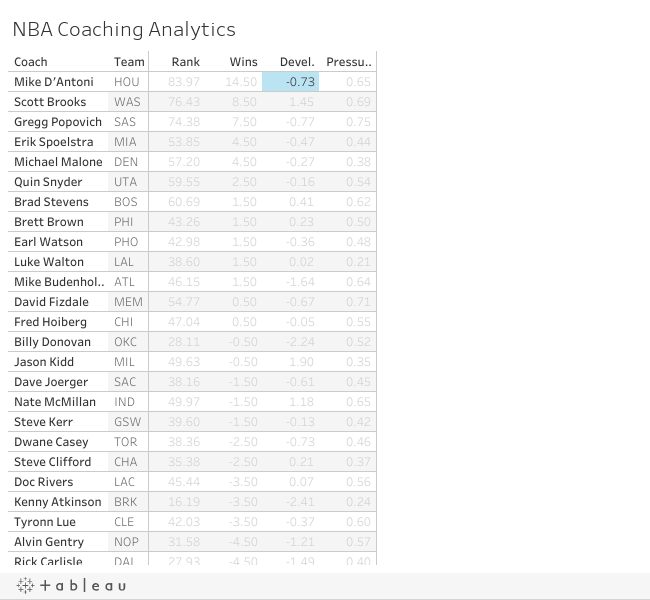 Here is an attempt at using data for what I deem to be 3 important measures of a coach’s performance and how this year’s crop of NBA coaches ranks overall. How well has a team performed this season and how many wins are they now projected to have vs what was predicted in pre-season. Rather than just looking at total wins, we need to look at how many wins were actually projected for a team. It’s no good saying a coach has done a poor job when there team was projected to only win 30 games based on the talent of the roster. If a team was projected to win 30 games and they are now headed for 40 wins that is exceeding expectation and should be seen as a great job by the coach. How a coach develops players, particularly in their younger years is a critical component of coaching. I have measured this by taking ESPN’s real plus-minus (RPM) data (http://www.espn.com/nba/statistics/rpm/_/page/1) which is a measure of an individual player’s effectiveness on court and is a reasonable way of then comparing player’s performance as we have one single number to compare players against. I look at players under the age of 25 who have played 30 games this season and average at least 5 minutes per game. I have taken last year’s RPM numbers and compared them with this years to see how players have developed year on year. A player peak years are usually somewhere between 26-28 years old, so in their younger year's is where we should see progression and development. For Rookies, I have simply taken this year’s RPM numbers if they qualify for games played and minutes. What I try to measure here is how well a coach is developing younger players that are a part of the regular rotation. Discounting players who are playing very limited minutes or bouncing from the D-League back to the NBA, as these players are more in the hands of development and D-League coaches and are not NBA level players. This can be seen as the most subjective of the 3 measures in terms of the coach’s impact. It is often said that you find out what a coach is all about in the last few minutes of a tight game. There are many decisions coaches make in the final minute of a tight game, and these directly impact the overall result. Clock management, substitutions, play calling, timeouts are all in the control of a coach and can be the difference between winning and losing. To come up with an overall ranking of coaches, I didn’t just want to rank coaches 1 to 30 as it wouldn’t show the proportion of how good of a job some coaches are doing and how poorly others are. At the end of the day winning matters and it’s always going to be the most important measure of how a coach has performed. Is 60% the right number? No, it’s my opinion but I feel it’s in the ball park for how a coach is going to be judged when it’s all said and done. To get to a final ranking, as well as giving a weight to the 3 measures I have also normalized the numbers (Nerd Alert) to spit out a rating out of 100 for each coach. I have also allowed for injuries in the final ranking as this is a major factor in the final outcome for a team. An injury factor is applied to the 1st coaching measure of Pre-Season predicted wins vs Current projected wins before calculating the final ranking. Looking at the results they seem to give a pretty accurate ranking vs public/expert opinion. 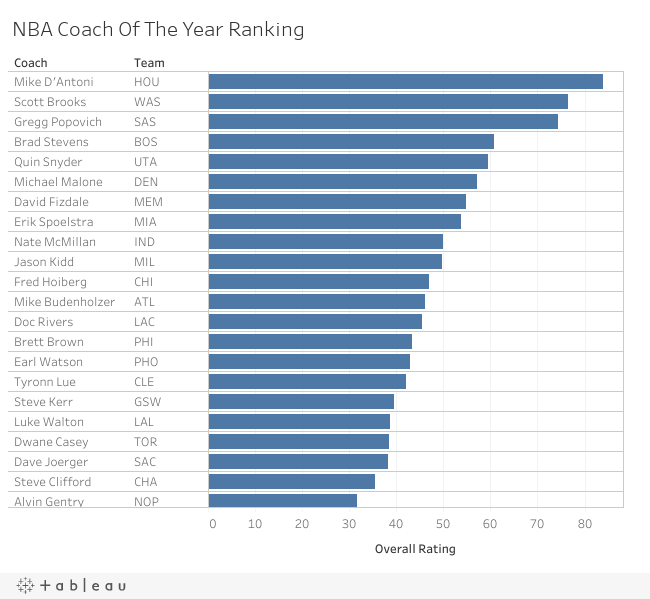 If you listen to “NBA Experts” the top names you will hear for this year’s coach of the year are Mike D’Antoni (HOU), Greg Popovich (SAS), Brad Stevens (BOS), Quin Snyder (UTA), Erik Spoelstra (MIA) and Scott Brooks (WAS) all of these coaches are inside my top 10. My rankings however show there is a clear top 3 this year with D’Antoni (HOU), Brooks (WAS) and Popovich (SAS) leading the way. Rick Carlisle of Dallas coming in 25th. This was the biggest oddity for me as the eye test would say Rick is doing a fantastic job with a pretty mediocre roster. Looking at the injury data, I found Dallas was ranked as the 7th most impacted team by injuries, so this is certainly a big factor. Secondly the pre-season expectations for the Mavs was probably a little too high in hindsight, I have no doubt the “Dallas is always competitive” being a factor in an inflated pre-season projection. Overall it appears as though the model has done a pretty reasonable job at ranking the performance of coaches this year with a clear top 3 to choose from. If we are handing out awards it goes to Mike D’Antoni of Houston who is highly likely to receive the actual award come seasons end. Cheers crow....have been working on a few things the last few months with machine learning, hope to have some posts to get us all through the off-season!